Fiber Drums with Lever-Lock Tops include steel chimes to reinforce tops and bottoms. 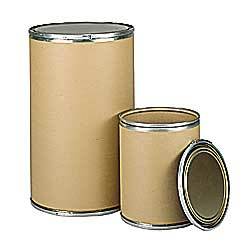 An economical answer to shipping or storing dry or solid materials such as pharmaceuticals or metal parts. Fiber drums will not collapse when full. Use locking steel band to secure contents. Stack up to 3 high. Constructed of a strong fiber material that will not corrode and contaminate product. Can be disposed of in accordance with EPA standards. Materials have been approved to meet FDA standards.